Decorating your nursery is one of the most fun and exciting activity during your pregnancy journey. So you've got the crib, the changing table and drawer dresser down pat. 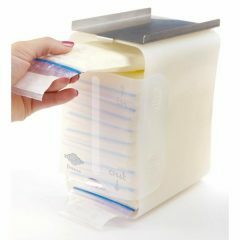 You even have your diaper pail ready and sitting in the corner. What else is missing? A comfortable rocking chair for nursery - the Glider. 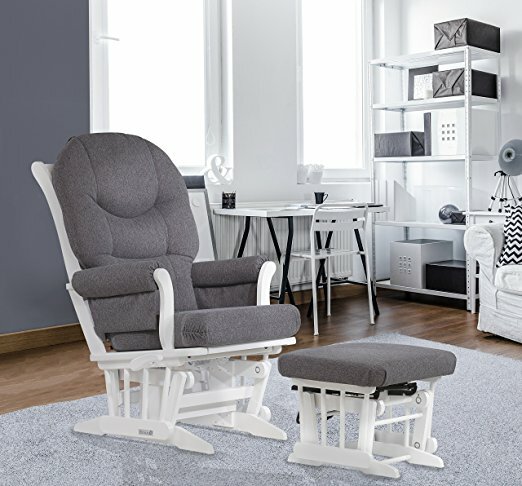 Similar to a rocking chair which has been around for generations and is a staple in nursery rooms back in the days, a glider is where mothers sit and nurse their little ones while rocking them to sleep. It is also where precious bonding time is made as parents cuddle and read to their little one. Also, sometimes you just want a comfortable chair for breastfeeding, and nothing beats the glider in this. Similar to a rocking chair which has been around for generations and is a staple in nursery rooms back in the days, a glider is where mothers sit and feed their little ones while rocking them to sleep. It is also where precious bonding is made as parents cuddle and read to their little one. While a glider is not a must and you can always do the same on an ordinary couch or your bed, you will not get the same consistent, rhythmic motion that mimics the womb simulation which puts your baby to sleep. 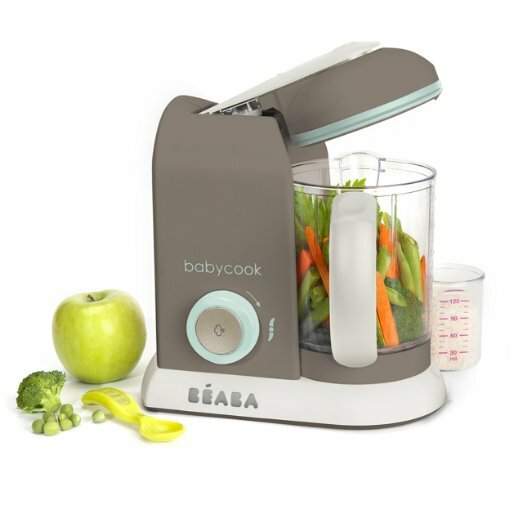 And if there's anything that can put baby to sleep a lot faster, you would want to get your hands on it, trust us. While the functions of both glider and rocker are generally the same, there is a major difference between the two, and it is in the way they move. The traditional rocking chair rocks in an arc-like motion, while a glider moves back and forth in a sliding way. The latter provides a more gentle and soothing motion that better calms and induces baby to sleep while also giving better comfort to parents with its upholstery and cushioning as opposed to the traditional wooden rocking chair (although modern ones do have cushions on them now). The other distinguishing element between the two is that the glider, at least most, is able to recline. This allows parents to find the most comfortable position for themselves because you will find yourself falling asleep in it, very often too. Parents still do use the term 'rocker' or 'rocking chair' interchangeably when referring to the glider nowadays as it is what it has been known for generations. It is used to rock baby to sleep, after all! Let us now look at the best rockers for nursery that are available in the market. There are many uses to a glider but most often than not, mothers use it to nurse their little one. 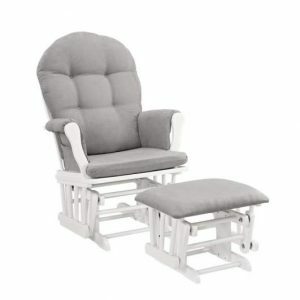 If this is going to be your primary purpose of using the glider, then the Naomi Home Brisbane Glider & Ottoman Set is the best rocking chair for breastfeeding. With breastfeeding, there may be times that you need to sit in the same position for a prolonged period without much moving. It can get very tiring if you're seated in an uncomfortable chair or position, which is why it is important to find the most comfortable nursing glider to alleviate any discomfort that may present. The Naomi Home Brisbane Glider is a high back nursery glider and it comes with a matching gliding ottoman. Both of these are essential features to ensure comfortable breastfeeding sessions. The tall back will provide adequate support to not only your back, but your neck and head as well. This is especially important if you have a bad back to start with. The ottoman, on the other hand, is just for your overall comfort. Weary mothers will agree how blissful it feels to have your feet elevated after a busy day, and it certainly helps with your breastfeeding comfort level too. We like how smoothly the Naomi Home Brisbane glides without making annoying creaking sounds. Its plush cushion and padded arms offer plenty of comfort, it is definitely one of the most comfortable baby glider in the market. However, we wish it will include a lock mechanism that locks the gliding when you stand up. Being one of the top rated nursery gliders, this high back glider rocker is surprisingly priced at a very reasonable and affordable range, especially when it includes a matching ottoman. 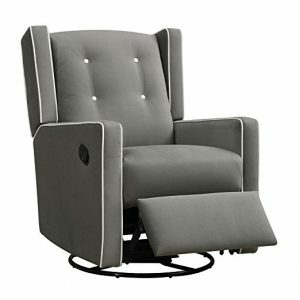 It is no wonder the Naomi Home Brisbane Glider & Ottoman Set is the number 1 bestseller in the nursing chair department! 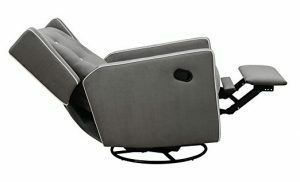 The Dutailier Sleigh Glider-Multiposition, Recline and Ottoman Combo is the best glider and ottoman set to get if you have a slightly bigger budget to spend. It is not often that you get a glider recliner with ottoman because most other brands usually come with one or the other i.e. if it has a reclining function, an ottoman won't be included and vice versa. The Dutailier Sleigh offers just that, and it is one of the most comfortable glider recliner in the market. This glider and ottoman set has a great mechanism that allows the backrest to be fully adjustable. This means you can maximise your comfort level because you won't be restricted to just one position. The best thing is, it will still glide when in reclined position and this is a huge selling point to most parents. 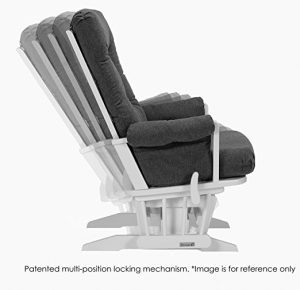 Simply nurse in an upright position or relax in a more reclined angle, whatever suits you. With the multiple reclining angle, you can nurse in an upright position and then relax in a more reclined angle in the most comfortable glider recliner. Remember the down side of the Naomi Home Brisbane Glider & Ottoman that we mentioned earlier? This is completely eliminated with the Dutailier Sleigh thanks to its multi-position mechanism that locks the glider in 6 different positions. This makes it not just easier to sit in or step out of the glider but safer too. This glider rocker with ottoman offers an exceptionally smooth and extra long glide motion with thick cushions and padded arms that will add class and elegance to your decor. 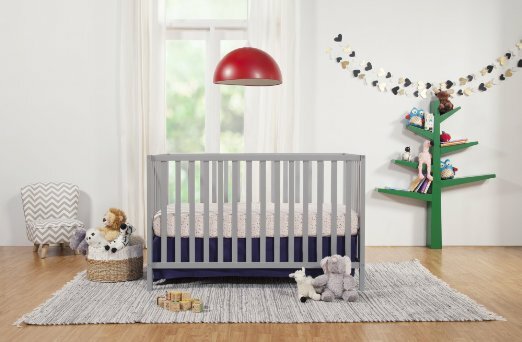 Even if you no longer need it for the nursery, this grey nursery glider and ottoman will be able to still blend in seamlessly with the rest of your furniture (click here to check out what other colours it offers). 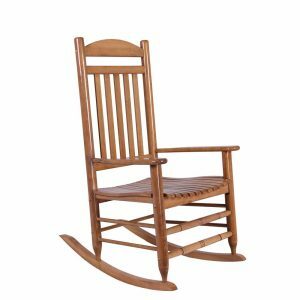 Even though the Dutailier Sleigh Glider is not one of those cheap rocking chairs for nursery, it has everything you need for one and it comes from a brand trusted for its outstanding craftsmanship. You can be sure this glider rocking chair with ottoman is worth every penny spent on it. Nurse in an upright position or simply relax in a more reclined angle in the most comfortable glider recliner. Not all nursery or living rooms are big enough to fit a glider rocker and ottoman. Does this mean you have to compromise on your comfort level? Of course not! Baby Relax Mikayla Swivel Gliding Recliner is one small rocking chair for nursery that glides, reclines and swivel. 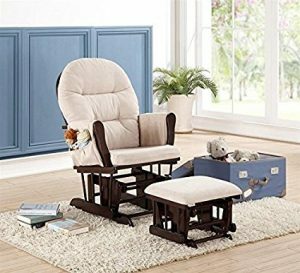 Yes, this is the best nursery glider recliner for parents who do not have enough space for an extra ottoman, without compromising either the reclining or footrest function. On top of it, you get to swivel 360 degrees which means you get to face different directions even though it is put in one place. The pop-out footrest will stay locked in place if you happen to doze off in it. There are quite a number of this type of swivel rocking chair for baby nursery in the market, however, not quite many are like the Mikayla Swivel. For example, it continues to glide when in recline position which is something a lot of other brands fail to offer. It also has a higher back than most other similar-looking upholstered glider rocking chair for nursery, making it ideal for breastfeeding when in upright position. 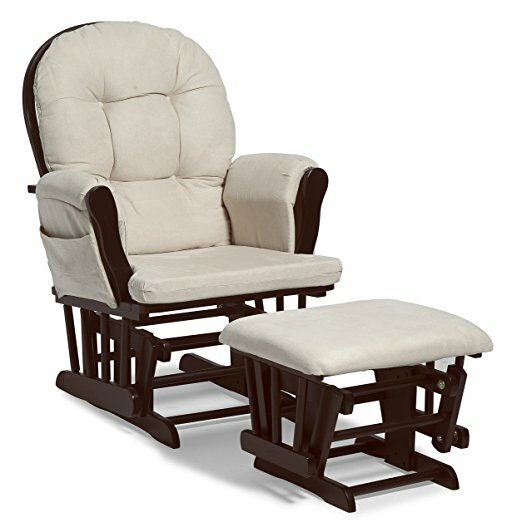 This swivel glider rocking chair is one of the best gliders for nursery we have came across. First of all, it is fully upholstered. Upholstery is always a plus compare to wooden gliders (with padded armrest, nonetheless) in terms of comfort level and the fabric used for this one is easy to clean. It also has a supportive spring core foam filled seat which makes it the most comfortable rocking chair for nursery to sit on, and the track arm design allows for a comfortable place to rest your arms. We especially like the elegant white welt trim that accentuates the shape of this recliner, making it look plush and luscious even in other rooms without looking out of place. Baby Relax Mikayla Swivel Gliding Recliner is definitely the best swivel glider for nursery that also reclines and is fully upholstered. If you are limited by space, this small rocker recliner for nursery is the best chair glider rocker that you will not regret buying. Upholstery that is easy to clean. Track arm design that allows for a comfortable place to rest your arms. 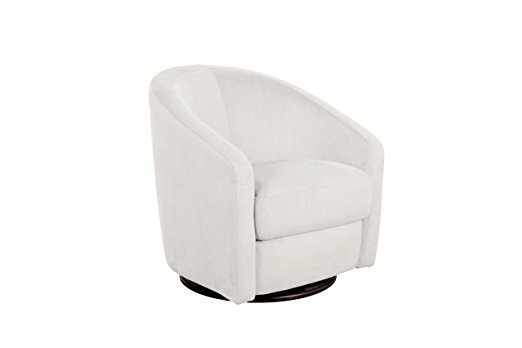 Elegant white welt trim that accentuates the shape of the recliner. White button tufting on the back rest add the perfect finishing touch. Some people do not fancy pop-out footrests like that of the Mikayla Swivel and would very much prefer the standard ottoman. Or it could be that pop-out footrest is not long enough to accommodate long legs. Yet, they like the full upholstery of the Mikayla Swivel. If this is you, the DaVinci Olive Upholstered Swivel Glider with Ottoman is the best upholstered glider for nursery you're looking for. 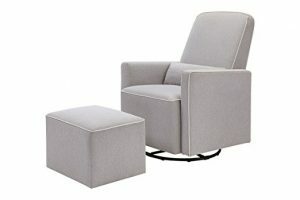 This is the Mikayla Swivel minus the reclining function but with a ottoman. It still swivels 360 degree and glides smoothly in a forward and backward motion, and is fully upholstered in 100% soft and durable heathered polyester fabric. The matching ottoman is upholstered likewise, and a lumbar pillow is included for extra lower back support. This is one of those tall back glider rockers that is recommended for long breastfeeding sessions with its 39.75 inches high back, which is 2.75 inches taller than the Mikayla Swivel. Together with the lumbar pillow provided, it makes for one most comfortable glider chair available in the market, if you are to sacrifice the reclining function. Everyone would love to have the full package, but when you have limited space in your nursery forcing you to choose between reclining backwards or extended legroom in the front (there is simply not enough space for both, length-wise) and you choose the latter, then you will not go wrong with the DaVinci Olive Upholstered Swivel Glider with Ottoman, the best upholstered glider and ottoman set. Everyone would love to have the full package, but when you have limited space in your nursery forcing you to choose between reclining backwards or extended legroom in the front (there is simply not enough space for both, length-wise), and you choose the latter, then you could not go wrong with the DaVinci Olive Upholstered Swivel Glider with Ottoman, the best upholstered glider and ottoman set. Not all of us have a big nursery, we know. If yours can only fit one small rocking chair with no room for any backward reclining or ottoman in the front, then the Babyletto Madison Swivel Glider is your answer. It doesn't mean you have to sacrifice having a glider at all if you have really limited space. This small rocking chair for nursery will fit even the smallest of small room. And given its stylish and minimal design, you can easily blend it in with the rest of your furniture when your nursery no longer needs it. Yes, it does not recline, but it is able to swivel 360 degrees on top of gliding forward and backwards, so it still makes for a good small glider chair for nursery. And because it is fully upholstered, you know you can sit comfortably on it to nurse, cuddle and even read bedtime stories for your little one. Further, it is made with a water and stain resistant microsuede so you can wipe it clean easily for any accidental mess. Do note that it does not have a high back so it may strain your back a little if you are to have long feeding sessions. Nonetheless, you can always use an extra pillow to alleviate this, as most mothers do. Not every nursery can fit a glider rocker and ottoman so if you want a space-saving glider rocker for small spaces, get the Babyletto Madison Swivel Glider - the best glider for small space. Further, it is made with a water and stain resistant microsuede so you can wipe it clean easily for any accidental mess. So what if space is not what's limiting, rather, you have a tight budget to play with? Don't worry, we've got you covered with Stork Craft's Hoop Glider and Ottoman Set - the most affordable rocking chair for nursery. It really does look like the classic rocking chair, except it glides forward and backwards instead of in arc motion. You also get plush seats, padded armrests and back cushions compare to the traditional ones, with a pocket to store your belongings at the side. This is the ideal glider and ottoman combination that is by far the least expensive we can find which won't break your bank. 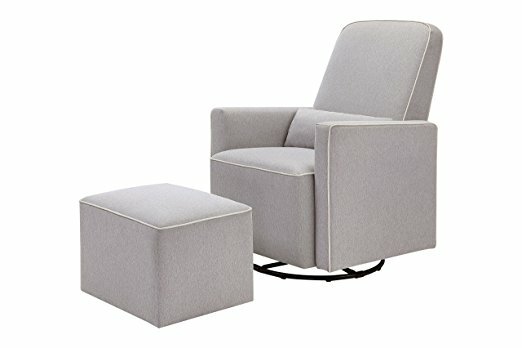 It may not be the best nursery glider and ottoman in that it does not recline very far back, and albeit rocking out smooth motions, it will make a small creaking sound (just make sure you don't screw too tightly and it shall be fine). However, it does its job and it comes with an ottoman, which is rare as a budget option. Overall, the Stork Craft Hoop Glider and Ottoman Set is the best nursery glider on a budget. With a high back, it makes for one good glider for nursing too. Size. This should be the first thing to consider. 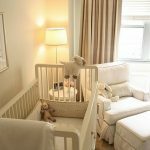 You do not want to make a purchase that you will need to return later so make sure you do your room measurements first, especially if you have a small nursery to work with. High back. Ideally, you should find a glider that comes with a high back because it gives your body better support to make for those long feeding sessions. Arm rests. The best glider chair for nursery will always have arm rests because you will need them, trust us. Your arms will get tired after holding your baby for awhile so having arm rests really do make a lot of difference. Ottoman. As with arm rests, you will appreciate the existence of an ottoman to elevate those tired legs after a long day. This is a deciding factor because it is one of the starting point (besides size) to consider when looking for the best baby nursing chair. Recliner. Likewise, you will need to decide if you want your glider to recline also or not. Ideally it will be yes, however, this is something you may want to consider eliminating if you have very limited space. Price. As with anything else, price is always a deciding factor. If you have unlimited budget to spend on your nursery, by all means go for the creme de la creme; otherwise, this affordable rocker for nursery is a good choice too among all cheap rocking chairs for nursery. Similar to a rocking chair which has been around for generations and is a staple in nursery rooms back in the days, a glider is where mothers sit and nurse their little ones while rocking them to sleep. It is also where precious bonding time is made as parents cuddle and read to their little one. Compare and find the best glider deals this Black Friday and Cyber Monday! This swivel glider rocking chair is one of the most comfortable nursery glider we have came across. First of all, it is fully upholstered. Upholstery is always a plus compare to wooden gliders (with padded armrest, nonetheless) in terms of comfort level and the fabric used for this one is easy to clean.